Unfortunately, this photo isn't as sharp as it should be. 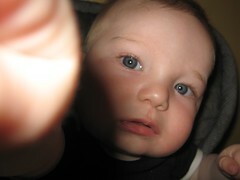 But it isn't easy photographing a moving target. 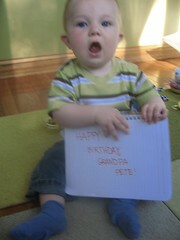 Finn wanted to take this opportunity to wish his Grandpa Pete a very happy birthday! Finn's Gramrene got him a whole bunch of little stuffed dinosaurs, since Shawn loved dinosaurs so much when he was a little kid. 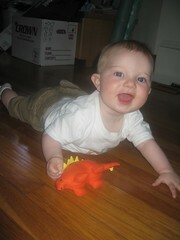 Dinosaur love must be genetic, because Finn won't stop playing with these little guys. He grabs them, flings them and chews their heads like some giant prehistoric baby dinosaur killer. I'm not so sure I believe the asteroid theory of extinction any longer. Yes, those are boxes you see in the background. But that's the last of 'em. Honest. We're waiting for a big Room & Board delivery. I know this photo is a little blurry, but you'd be a little woozy, too, if you read the same books several times a day. Finn is only 9-1/2 months old and I already know all his books by heart. One of his favorites is the classic Goodnight Moon, a book whose bizarre subtleties cannot be appreciated until it's read for the 900th time. Frankly, it's a little creepy. Sure, there are two little kittens and a pair of mittens. But there's also a quiet old lady whispering "hush" who has a rabbit head and a person's body. 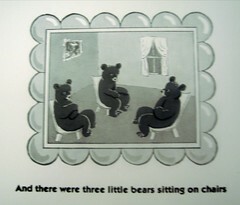 And, the picture of the three little bears sitting on chairs appears to capture them in midst of group therapy. The bear on the left clearly has issues. Just look at how uncomfortable he looks. I spare Finn the subtext, and focus on the comb, the brush, and the bowl full of mush. 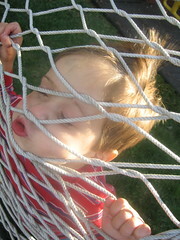 But if he's way into David Lynch movies when he grows up, I will know why. This photo makes me so happy. Sigh. I can dream. Could he be cuter? I mean, seriously. 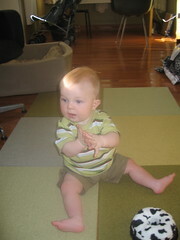 Finn says "yeah" for our new Flor carpet tiles in the sunroom. Hopefully, he'll put them to good use by crawling on them soon. The place is starting to come together. I will post more photos after this weekend when we hang more photos. As his sheer mass could no longer be contained by the baby bathtub any longer, Finn has graduated to the regular old bathtub. He did his best to swim laps in there--he couldn't believe the vast potential for splashing. 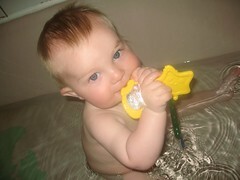 Wait until he goes to his first baby swim class at the Y tomorrow. 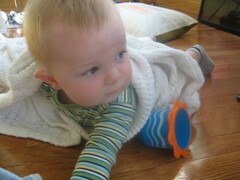 Finn might not be able to crawl yet, but this doesn't stop him from wriggling, wrestling and worming his way all over any surface that will support him. Floors? Yes. Bed? Yes. Mama's elastic-waisted skirt? Notsomuch. 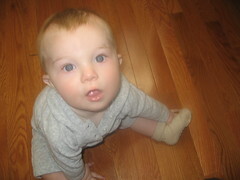 Changing this guy's diaper is an aerobic event akin to wrestling a greased boar. It's as if he's thinking, "While you attempt to change my poopy diaper, I'm wasting valuable time that could be used wiggling on something, and very possibly chewing on it." Finn has become *quite* the mimic these days. He imitates your voice, your motions, even pats the sofa along with you to invite the dog up. 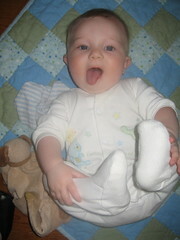 Daddy discovered this weekend that when you stick out your tongue, Finn will do it right back atcha. 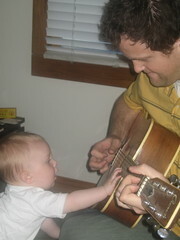 Here he is wishing Daddy a Happy First Father's Day. 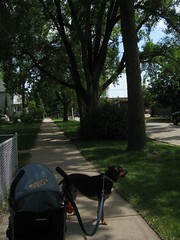 "Carrying him around is like carrying a 20-lb. sack of potatoes." We need a new nickname before he starts thinking his name is Joe. Brit, don't let us down. Listen. I know you're sitting down with Matt tonight. And I know you're going to set the record straight about the most recent driving incident. And the changing the baby's diaper in the middle of a store thing. And the dressing your defenseless son like your talentless "rapper" husband. But what I really hope you do is tell the world that you've found salvation and his name is Perry. (Please, people! The Manny has a name.) Brit, we're all rooting for you. Finn likes to watch me work. 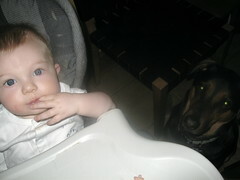 The highchair has proven to be a bridge of lifelong friendship between Santos and Finn. You can barely see Santos here, but for his beady eyes. 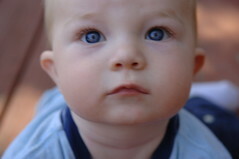 But when he hears the click of the tray snapping into place, he bounds to Finn's side. 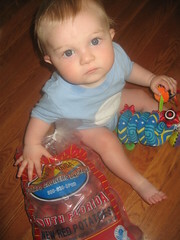 Finn will munch away and when I'm not looking, slip Santos a Veggie Puff or two. These two know how to play me. We had a bunch of friends over Sunday for a rather chilly summer cookout. I mean, look how cold Max was. See all the pics here. We here at Babymania are enthralled with all things Britney. (Well, at least I am.) I was pregnant the same time Britney was last year, which was awesome compared to sharing your pregnancy with a celeb like Gwyneth, because I could eat whatever I wanted. Britney set a new standard, and all of the sudden I didn't feel guilty about all those ice cream sandwiches. 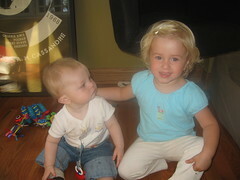 Then, our pregnancies came to a glorious conculusion when Finn and Sean Preston were born mere days apart last September. But I recently jumped on the bash Britney bandwagon after a bunch of bad press surfaced. Then I realized that girlfriend needs a break. She's a new mom just like me, and heaven help me if paparazzi followed me around everywhere, chronicling my every misstep. My new stance is that poor Britney gets a bad rap. And I'm not even talking about her pitiful husband's music career. She's doing the best she can. It's hard enough for the rest of us and we don't have aspiring white rappers for husbands. That's why I love seeing these pics of Brit being accompanied by her hot new manny. Manny, I don't know who you are, but you're no KFed. 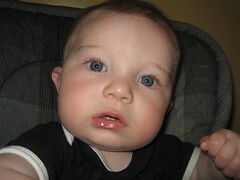 Click to enlarge the photo to see the newly minted teeth--now visible with the naked eye! 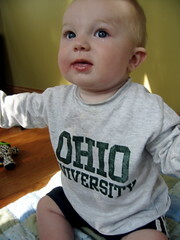 Here's Finn sporting a T-shirt from my alma mater. 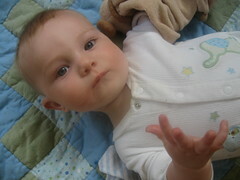 He probaby just heard it's a party school. Which way to Pawpurr's? Remember when we moved out here, I blogged a photo of a rainbow right above our old place on Shafter right before we moved? Well, here's a rainbow in our new backyard. Hopefully a good omen. So, I have a funny story about rainbows. About a year and a half ago, I was riding BART home during rushhour and saw the most brilliant rainbow out the window over the East Bay hills. It was standing room only on that BART train. Everyone was totally absorbed in their reading material and/or iPods. But this rainbow was too great not to share, so I said to a silent, but crowded BART train, "Hey everyone! Look out the window! There is the most amazing rainbow!" I have never been received as such a freak. The woman next to me inched closer to the window, the man across from me held his magazine over his face. 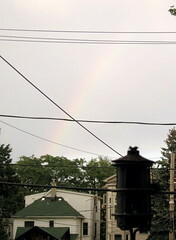 Only one person, a diminutive gay man (ostensably out of pity), said "Miss, thank you for sharing your rainbow with me." So, here, I share my rainbow with you. No judgment.